Planning a large event and looking to fill the entertainment void? You have so many great options when it comes to keeping your guests occupied and happy. You could hire a live band, assemble a playlist for your iPod, or (if you’re smart) you can hire a DJ for the whole night. The music at an event is always the main source of entertainment; this can make or break the occasion! In theory, it sounds like a great idea to hire a band or musician to play at an event. And while we agree that there is a certain “je ne sais quoi” about having a 5 -8 piece band performing live, it’s not always the best choice to have live music throughout your entire event. There is a time for live music, and a time for a DJ. Keep in mind that professional musicians often have a specialty. They can sing beautiful ballads but they might not be able to curate a set filled with Beyoncé and Pitbull. Even the best musicians have a limit. There will often be breaks in between while the musicians are adjusting equipment or quenching their thirst. It’s impossible for live musicians to keep up a solid 3 hours of entertainment. Live music creates a great energy that can be felt throughout your venue. It’s not just music, it’s an experience! With bands you’ll have a unique, authentic sound that can’t be obtained any other way. You’ll find that often times, musicians focus more on the music and less on the schedule you have laid out for the event. Cake cutting? Too bad – they’re mid song. A natural part of having live music is the break in between songs or sets. They have to set up various instruments, make adjustments, and rest for a moment (who can blame them?!) – but it doesn’t translate well for an all night long event. Some musicians will charge extra fees if you would like them to learn a particular song. It is extra time that they have to spend seeking out and practicing the new song. Not all musicians are great with crowds. Sometimes you can find one who really knows how to work a room, but it isn’t rare to only find ones that are strictly focused on music. With a disc jockey, your music selection is unlimited. Different genres, styles, instruments… you can truly have anything you want. DJ’s are interactive. 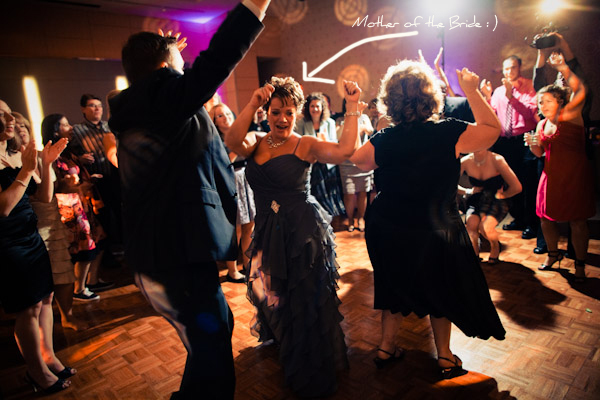 You’ll often find your DJ joining in the audience of couple’s dances and even Father-Daughter dances. The whole JOB of a DJ is to keep the energy of the event moving. There are no breaks in disc jockeying. DJ’s with no personality can ruin your event. Luckily this is easily prevented by making sure you know who you are hiring. In conclusion? By all means – hire a live musician that can play a few very important songs, but make sure you have DJ to back them up when they are all done. DJs can be very versatile with their work. We are able to play any song ever made, create remixes, andhost the event so that everyone is connecting. . We have an endless stream of entertainment at our fingertips. Your guests have special requests? No problem. We’re great at catering to the crowd and adjusting our list to fit the party. Before choosing your DJ, meet with them in person. We have invaluable information that we share with our prospects.. We’ll explain our strong suits, our capabilities, ourspecial talents, and we can see if we’re a good match. Since we will be working for you on your special day, we are totally open and respectful of your likes and dislikes. Don’t be afraid to request a list of references from our past clients. It’s a great way to hear directly from people who have worked with us and know how we perform. If you have specific needs or accommodations that need to be fulfilled, mention it during our meeting, so you will know right away if we will be a good fit for your event. If you think it is too expensive to book a professional DJ, then wait till you hire an amateur! How Can Up-lighting Improve Your Event? Up-lighting is a light source that is placed around the perimeter of your event space. This lighting is typically aimed up towards the wall and ceiling to create a glow over venue. The secret to creating this ambiance lies within the type of lighting and also where to place the lighting fixtures. This simple process can create an aesthetically pleasing and exciting environment for every guest! 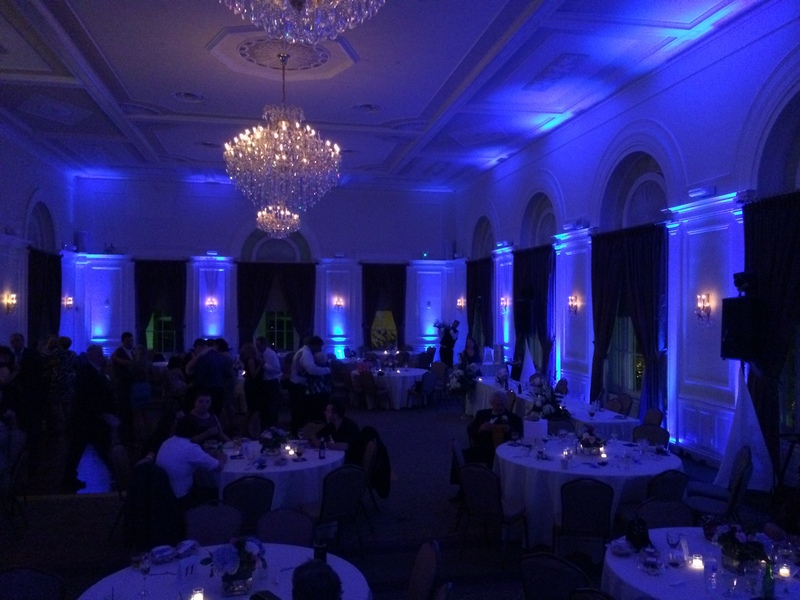 Event up-lighting will enhance and boost the already gorgeous aspects of your occasion. 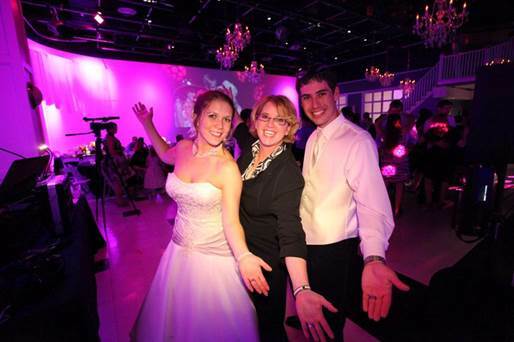 Up-lighting can usually come in an assortment of colors to accent your event perfectly. Also, it can be used just about anywhere in your venue, so you can spotlight certain areas or make your whole entire perimeter glow! Typically being controlled from the DJ or they can be wireless and battery operated, your up-lighting can change colors, patterns and intensity throughout the night. You’ll be able to discuss with Kelli the details of how you want your up-lighting to perform. We can provide static lighting where the colors stay the same, or we can create programmable lighting which will change colors and create movement within the room. The size of your event perimeter and the number of people who will be attending your event will determine the amount of up-lighting you will need. This source of luminescence can completely change the look and feel of an entire venue and emotion. If your venue isn’t the beautiful setting you dreamed of (or even if you simply want to boost beautiful features) up-lighting could transform the space to a beautiful and stunning atmosphere, therefore creating more excitement. Takes the place of extra or unneeded décor that may be more expensive. Most event venues are rigged to be able to accommodate up-lighting with plenty of outlets spread throughout. But if you are celebrating with an outdoor wedding or have chosen a primitive location, you’ll need to make sure you have the details figured out. Wireless and battery operated units are available for these scenarios. How many rooms are you lighting? Multiple areas filled with up-lights leaves a profound effect. Are there areas that would do better with extra lighting? We can help you figure it out! Is your event mostly taking place at night or day? Up-lighting leaves the best impressions in a normally dim ambiance and is therefore better suited for nighttime events.